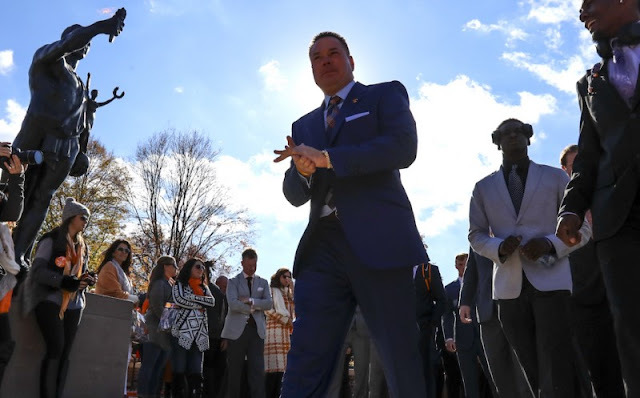 Shirts With Random Triangles: "The Championship of Life": Butch Jones attempts at being philosophical over not winning SEC East go virally awry. In a press conference Monday. Jones tried to explained that while the Vols' seniors aren't living school as SEC East champs, they were "champions" in something bigger through becoming or being college graduates. "These individuals mean a lot to me personally and they mean a lot to our football program. When we walked about winning championships, they're a champion. They've won the biggest championship and that's the championship of life. And they're going to be college graduates. Some of them are already college graduates. Whey they've brought from a leadership standpoint, from a stability standpoint, from getting Tennessee football back - it used to be just win a game, now it is not just winning the game, it's how you win the game, it's now what's next. That's everything that they've built over the course of time. I talked about being 14-3." Winning the "championship of life" has already become a meme, with multiple tweets you've probably already read. I'll just leave this one showing Jones' Wikipedia page here.